Buying a Virginia For Sale By Owner Home and Need Help With the Offer-Contract? Are you a Home Buyer? Have you found a For Sale By Owner (FSBO) Home you want to buy? We have the solution for you. The For Sale By Owner Assistance Option is perfect for sellers and buyers that do not have a Realtor. We are fully licensed Realtors offering this service for a flat fee. The program will take the hassel out of the paperwork and assist you with drawing up the offer and assistance all the way through closing. FSBO has arranged discounted pricing through our referral network of recommended settlement companies. We are able to offer these huge savings to our clients because of the volume of business. If you would like to take advantage of our discounted services, sign up today. Assist in meeting the requirements of the Purchase Agreement, as in inspections, reports and other items. 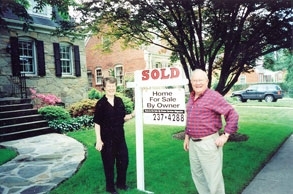 Facilitate Communication between Buyer and Seller to help prevent disputes from arising. The Settlement company will hold the earnest money in escrow. Assist in meeting the requirements of the closing agent in connection with the closing on behalf of the Seller and Buyer. We are there for you when you have questions in order to bring your purchase to closing. We even go over the Closing Disclosures/ALTA (formerly called HUD-1) (if you want) to review your closing costs. After Hour support is available for an additional small fee. The choice is yours - Pay a Traditional Realtor 3% or or sign up for the FSBO Assistance Option Program for only a small fee to perform the same service. That means that if you are selling or purchasing a $550,000 home, a real estate agent will charge $16,500 for the same service. The agent will draw up the offer and assist you to closing day! ALREADY PAID for this service: CLICK HERE for the paperwork seller and buyer need to fill out for us to draw up the contract.